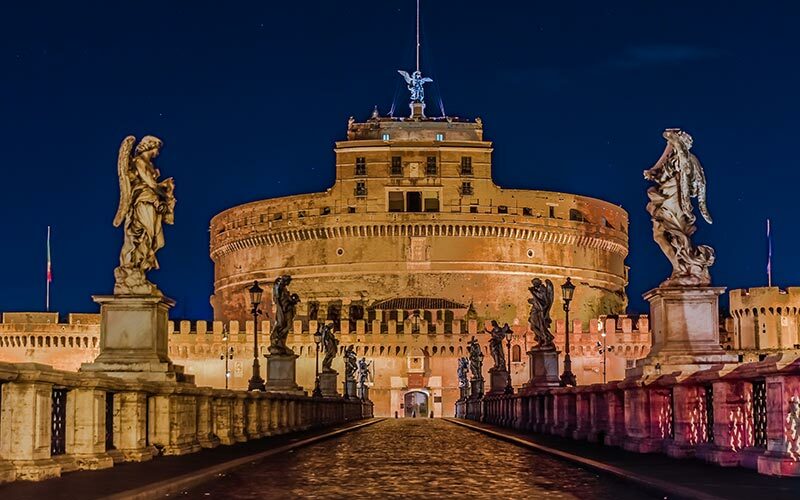 Given the fact that the majority of monuments in Rome are suggestively lit-up, a Vespa Tour of Rome By Night is a truly spectacular experience. 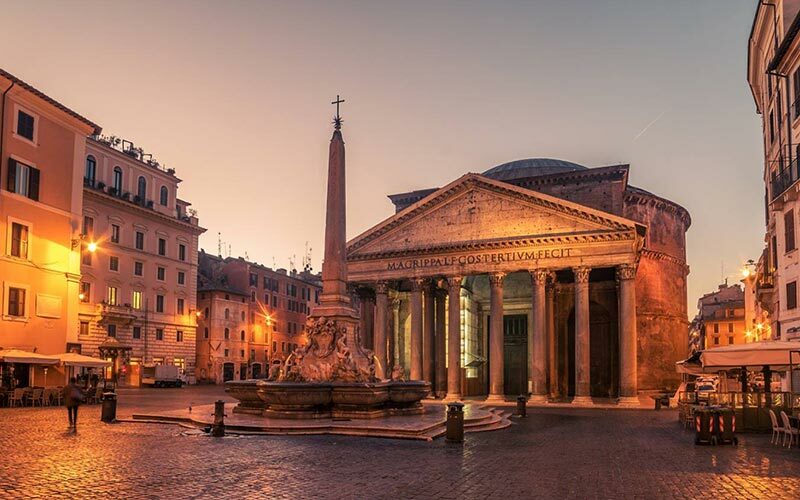 As well as giving you the opportunity of admiring the incomparable beauty of the Eternal City immersed in an evening’s magical atmosphere, it will allow you to savour its nightlife by going for drinks (soft ones of course) in all the “In Places” in town. Daniel Psenny, in an article on the prestigious Le Monde newspaper, writes: “Rome on a motorcycle is a dream. You can’t beat exploring its most hidden areas. It’s a City open to scooter riding. Bicycles are more ecological, walking is probably healthier, but discovering the inner alleyways on a Vespa is a true must.” At Buzz4Tours we couldn’t agree more of course! So as to give you the chance to experience all this, we supply our iconic, top of the range Vespas, with Bandana scarves and helmets and also a pre-set night tour on our mobiles. Forget the hassle of public transport or possibly expensive taxi fares, ride as you please in practically all traffic restricted areas. 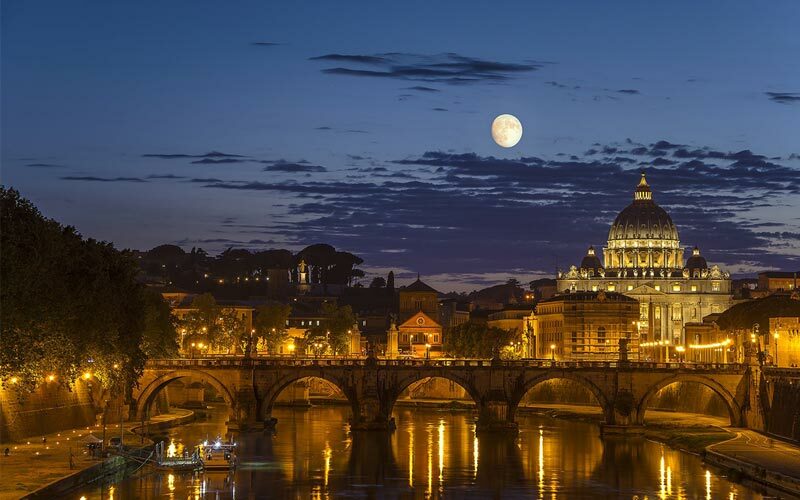 So now you are probably wondering which is the ideal Rome by night itinerary to follow? Well the first stop, can only be St. Peter’s Square. The piazza at night is simply enchanting. Bernini’s colonnade which symbolically embraces all who arrive, seems to belong to an archaic world as the warm lights gently caress the wonderful shapes. 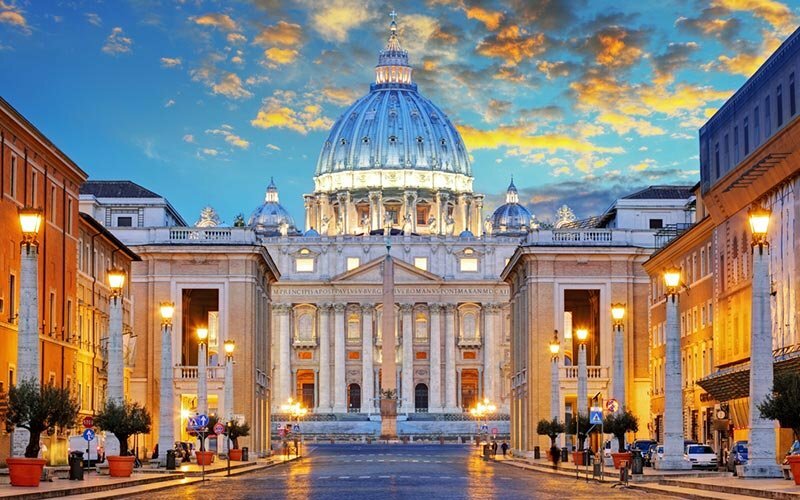 Saint Peter’s Basilica, a sublime work of art representing the very hub of Christianity, naturally attracts all who appear before it. Not only from a religious point of view but also from that of History of Art and Architecture aficionados. It is a strange sensation to have the St.Peter’s Square virtually to yourself. Nobody pushing and shoving, no crowd to keep you from the delightful detail. A luxury you will only be able to experience at night. St. Angel’s Castle encompasses many an identity. A mausoleum for emperor Hadrian, a fortified outpost, a prison and fortress complete with hidden passage ways. During the summer, evening visits are available to soak in the atmosphere in the Castle while you marvel at the views of Rome on The Angel’s Terrace. Opera buffs will remember that the terrace is where, Puccini’s Tosca, through herself to her death after her husband’s murder. Here’s a place where History, Art and romanticism mix in perfect harmony… a bit like Ebony and Ivory. Check out the other itineraries we have prepared for you. 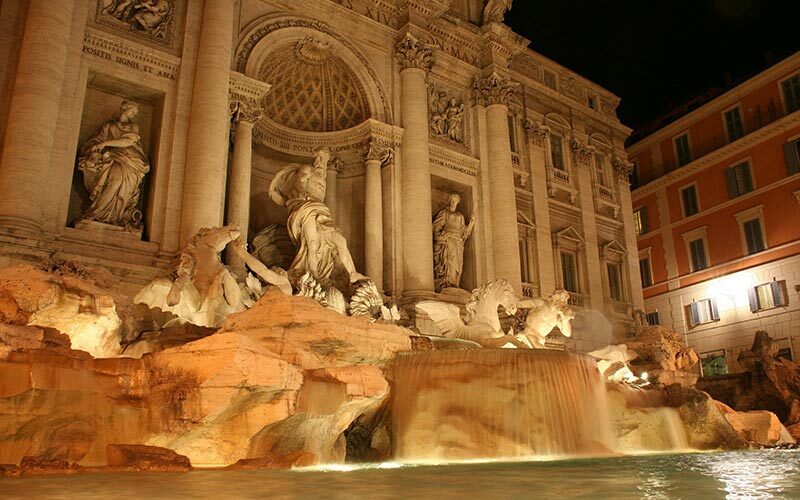 Each has been chosen to guide you around the marvels of Rome and show you attractions for all tastes. 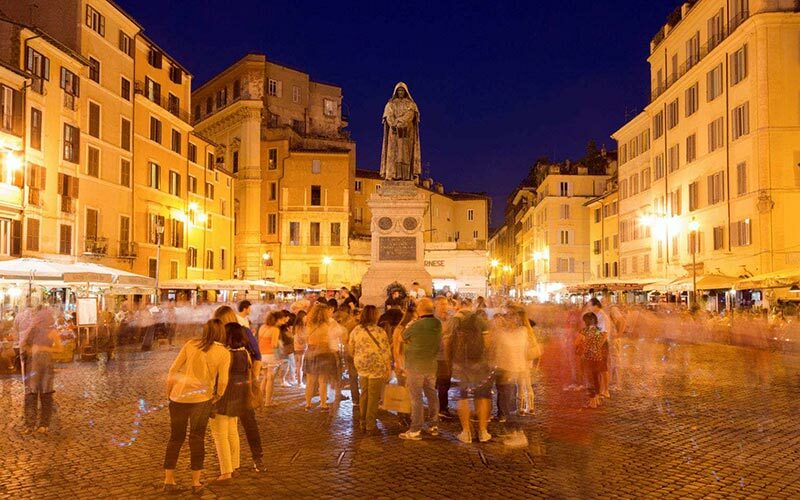 After the grandeur of St.Peter’s Basilica and the splendour of St. Angel’s Castle, a good glass of wine or a nice chilled beer (for your passengers only of course J ..) are just the thing to winde-down and Piazza Campo de’ Fiori is certainly the right place for it. The square takes its name from the flower market it used to host in the mornings. In the center, there is a statue of Giordano Bruno, the philosopher burned at the stake on charges of heresy against the Catholic Church in the year 1600. A note for the more gluttonous: those wishing to taste “pasta alla Carbonara” a typical Roman pasta dish, should not miss the restaurant called “La Carbonara” which is right on the piazza itself. For a quicker traditional tasty meal, you could opt for fried cod and vegetables at “Dar Filettaro” on via dei Librari 88. 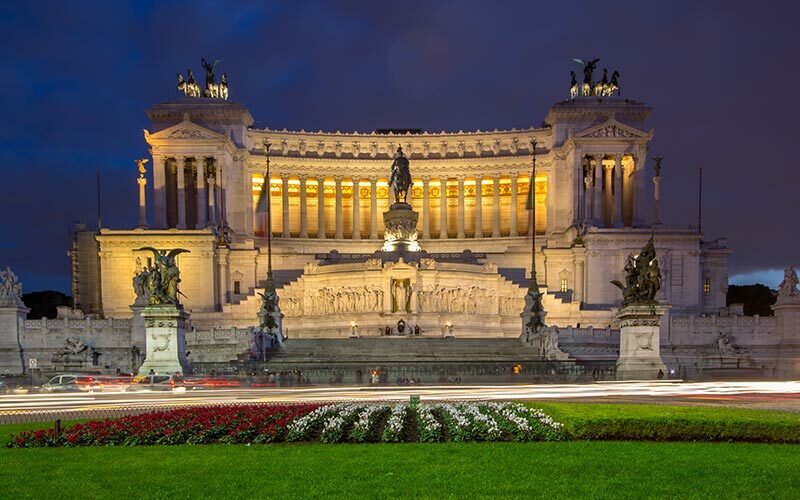 The next stop of the Vespa Tour of Rome at Night is a very imposing building known officially as the Vittoriano but more colloquially as the “Wedding Cake”. The huge white structure was given its name after the first King of unified Italy, Victor Emanuel II. The monument was built to honour and commemorate his death in 1878 as the father of the homeland and indeed of the whole historical period of the Italian Risorgimento. The monument was inaugurated by Victor Emanuel III on June 4th 1911 coinciding with the commemoration of the Unification of Italy’s 50th anniversary. The structure was inspired by Greek and Latin classic styles. At night, the Vittoriano assumes an intriguing aura of eternity about it, which cannot be missed. 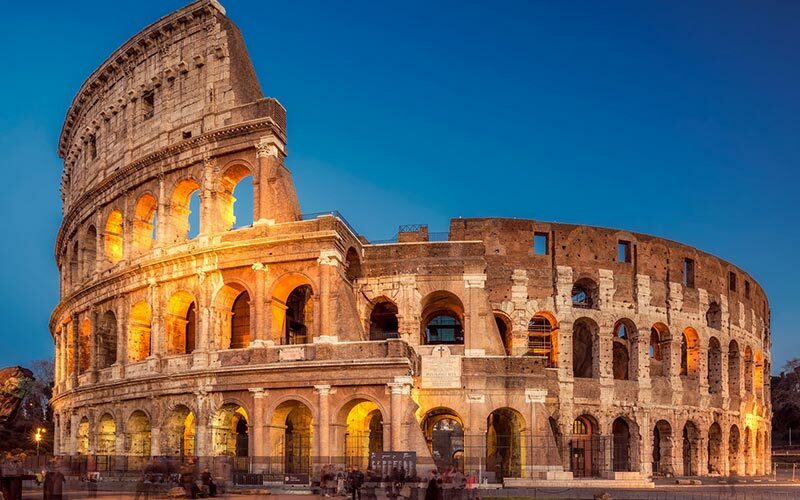 Any tour cannot, and must not, leave out a visit to the very symbol of the Eternal City: The Colosseum or, to call it by its proper name: “The Flavian Amphitheatre”. The Colosseum at night is truly magical, especially if the moon happens to enrich the shades of light around the colonnade. Night visits are available during some periods in the summer, to see all the rings that make up the colonnade, the arena that provided the setting for the bloody gladiator fights or even the winding underground passage-ways used by the slaves and animals. It’s now getting late, streets are slowly becoming deserted and tiredness is seeping in. But then Rome is full of marvellous places to see and a new day awaits. Contact us to rent your Vespa and discover new itineraries and famous and unusual places to visit. Make your Rome Vespa Tour all the more memorable with the new Vespa Primavera!